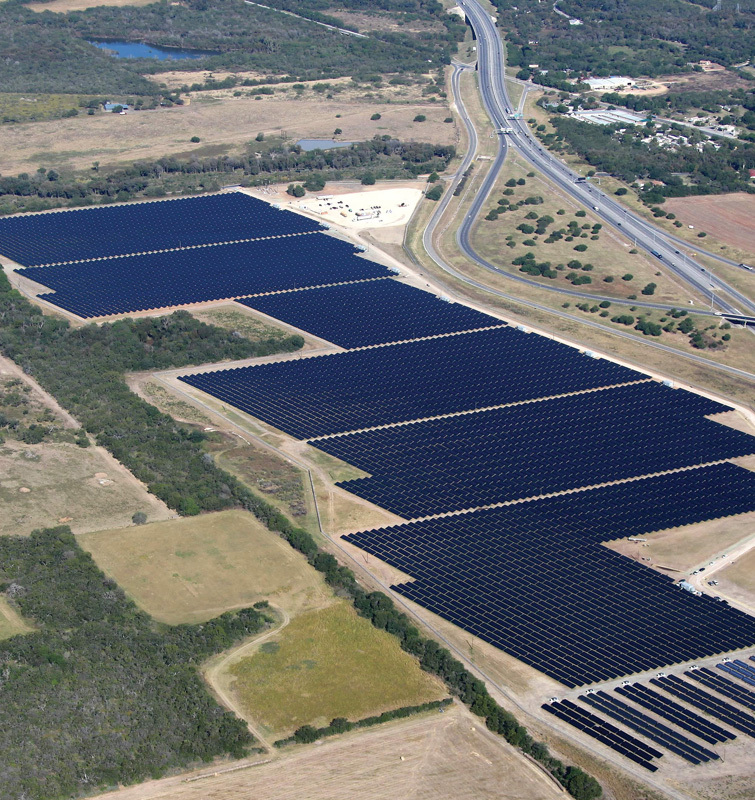 A 16.6 MW solar power system in San Antonio, recently completed for CPS Energy, is the largest solar power project in Texas and ranks as one of the largest in the United States. The old saying that things are bigger in Texas just may apply to the new 16.6-megawatt Blue Wing utility-scale solar project that went online in southeast San Antonio, Texas, late last year. Engineered, developed, and built by juwi solar Inc. of Boulder, Colorado, Blue Wing is the largest PV project in Texas and one of the largest in the United States. juwi sold the project to Duke Energy Generation Services of Charlotte, North Carolina, in early 2010, says Seth Kassel, juwi director of project development. juwi will continue to provide operations and maintenance services on Blue Wing initially. Under a 30-year Power Purchase Agreement, CPS Energy, which serves about 700,000 electric and 300,000 gas customers in Bexar County and parts of neighboring counties, will purchase all of the output from the farm as well as the renewable energy credits from Duke Energy. "We had our distribution engineers work very closely with juwi because they were connecting into our system," says Raul Cardenas, manager of CPS Energy renewable and emissions programs. "And it was beneficial to have it located within our system so our ratepayers could physically see it up close." As with other utility-scale projects it has developed and built, juwi acted as the general contractor on Blue Wing, Kassel says. From a short list of locations, juwi chose a 140-acre site off Interstate 37 and U.S. Highway 181 in southwest San Antonio. He says the decision was based on land cost, ease of interconnecting into existing CPS lines, and constructability. juwi also worked to obtain all the project permits and negotiated the Power Purchase Agreement with CPS Energy. The project sits in both the city of San Antonio and Bexar County, which meant juwi had to coordinate with both city and county departments. The city had never dealt with a utility-scale solar project before, so Kassel says it took a bit more time to help representatives become familiar with the technology. "As with the introduction of any new technology, you had to explain the characteristics of what we were building," he says. The zoning also had to be amended to accommodate the project. "Everything takes time," Kassel says. "We pay attention to the details. We worked very closely with the folks at the city planning office, and they were great to work with. "We've found that in most places, planners and engineers are interested and curious, but they have rules they have to follow, and we respect that. It's just fitting something new into existing codes and even writing new codes if necessary." San Antonio sits on the edge of the Blackland Prairie (an area that stretches north to Dallas), known for the Houston Black soil series. The soils, with their heavy clay content, are known for shrinking and swelling with changes in moisture content, according to the Natural Resources Conservation Service. juwi took that into consideration when designing the anchoring systems. "We looked at the geotechnical studies to design a racking that could properly hold the panels and handle the fluctuations in the land," Kassel says. Construction began in April 2010, with final commissioning in November 2010—two months ahead of schedule. juwi chose First Solar's thin-film CdTe modules because of their cost-effectiveness, he says. They are also rated to withstand hail stones, which have been known to hit San Antonio in the past. In addition, the thin-film modules perform better than crystalline modules under San Antonio's diffuse light conditions and high summer heat. "We understand that due to high solar radiation in west Texas, a solar project will generate more energy there than here in San Antonio," Cardenas says. "We're close enough to the coast that we get a lot of the coastal cloud overrunning. Developer juwi solar Inc., chose First Solar's thin-film CdTe modules for the project because of their cost effectiveness. They are also rated to withstand hail stones, which have been known to hit San Antonio in the past. To gain maximum electricity production when the sun is at its peak from noon to 2 p.m. daylight time, Cardenas says juwi recommended orienting the arrays due south. But peak electricity usage within CPS Energy's service area doesn't occur until late afternoon, so Cardenas says the arrays were situated at 25 degrees west of south to better match generation with use. The PV arrays are fixed at a 20-degree tilt. The mounting system for the PV modules was made up of 4,290 Solar FlexRacks, produced by Northern States Metals of Youngstown, Ohio. The racks feature a unique unfolding design that enables a three-man crew to install each to a ground post in less than three minutes. That compares with five to eight workers and installation times of 30 to 60 minutes for most other racking systems. SMA America Inc. of Rocklin, California, supplied the twenty-two 630kW inverters for the main project and the eight inverters for the demonstration project. Central Texas is known for frequent and potent lightning storms. To protect the project, 24 lightning rods were erected throughout the site to collect lightning strikes. If a bolt should hit an array, it will be isolated, since each array of 50 modules is grounded. On the site, there are more than 12,000 rack posts in the ground, 200 ground rods and more than 100,000 feet of ground cable. Newkirk Electric Associates of Muskegon, Michigan, acted as the prime subcontractor, and most of the workers were hired through local halls, Kassel says. At the peak, there were 115 workers on site, and they put in more than 100,000 man hours of labor. Construction of the Blue Wing solar project began in April 2010, with final commissioning in November 2010—two months ahead of schedule. 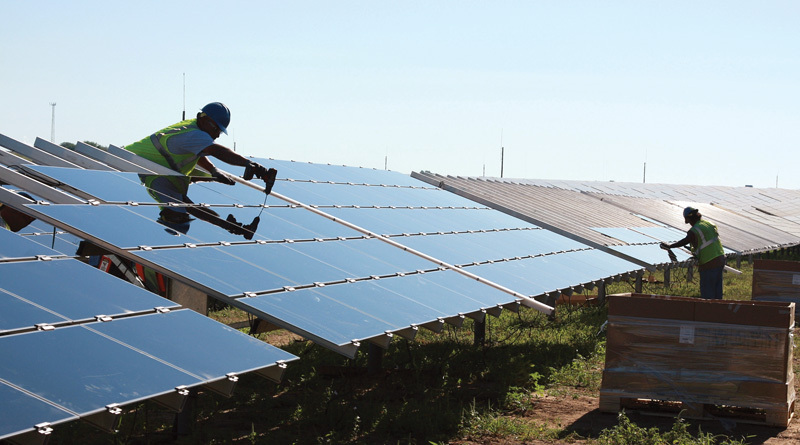 "The majority of the folks who had worked on the project had never worked on a utility-scale solar plant before, but that's pretty common as far as where we are as an industry," Kassel says. "We worked and trained them on implementation techniques, safety procedures, and working with DC systems." Because solar projects are built in modules, constructing them is akin to assembly lines at manufacturing plants. "Overall our focus is on working with our contractors and our venders to do it right the first time," Kassel says. "We take it slow at the beginning. But once you learn to do the tasks, you just multiply that thousands of times." Working in an urban area carries its own set of logistical challenges, but Kassel says careful scheduling helped eliminate most problems with traffic and deliveries. "We identify safe and efficient routes and the time of day when they should come and not come," he says. Because of its sheer size, the project was actually split into two distinct interconnected plants, with two 13.2 kilovolt lines feeding into two substations, which had to be upgraded to accommodate the project's output. An off-shoot of the Blue Wing project is a 500 kilowatt demonstration center that features eight different technologies. They include one concentrating PV unit, five different thin-film technologies, and two different crystalline module technologies. juwi proposed the concept, and Duke Energy representatives agreed it was a good idea, Kassel says. "The goal of the test facility is to understand not just performance from a generation point of view but also installation techniques," he says. "We work with all of the vendors to gauge their feedback." The Texas Public Utilities Commission has established goals for the amount of renewable energy a power producer must have in its portfolio. 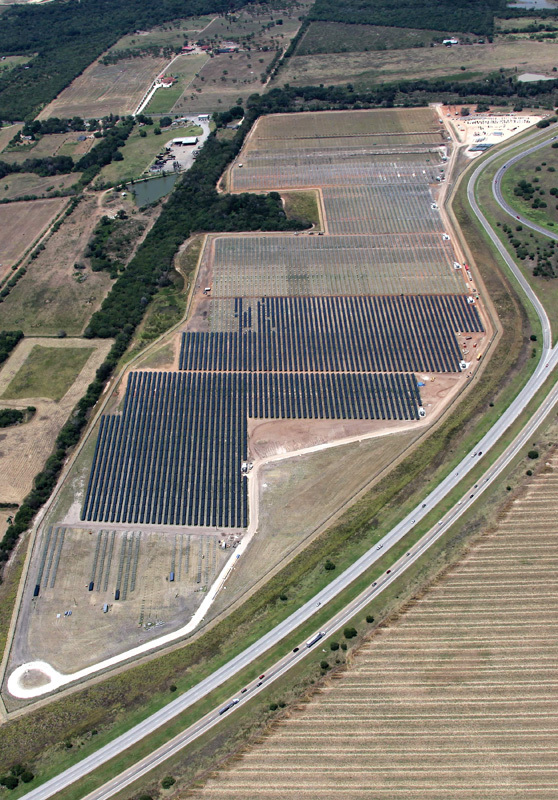 Construction The 140-acre Blue Wing project sits in both the city of San Antonio and Bexar County, which meant the project developer and builder, juwi solar Inc., had to coordinate with both city and county departments. As a municipal utility, Cardanas says CPS doesn't fall under those PUC mandates. The board of directors felt strongly enough about renewable energy that it developed its own goals. "The board agreed to a self-imposed goal in 2000, with the initial goal of 10 percent of expected peak in 2020," Cardenas says about the amount of renewable energy in the CPS portfolio. "Then it was solidified to 15 percent of the projected 2020 peak. It went from there and changed to about 20 percent of the peak by 2020." Since the peak can fluctuate by up to 1,000 MW, Cardenas says the board finally ended up with a solid goal of 1,500 MW of renewable capacity by the end of 2020. With Blue Wing on line, CPS has 916 MW under contract, of which 883 is being delivered as power. Up until the Blue Wing project, the bulk of the renewables in CPS' portfolio came from west Texas wind farms. 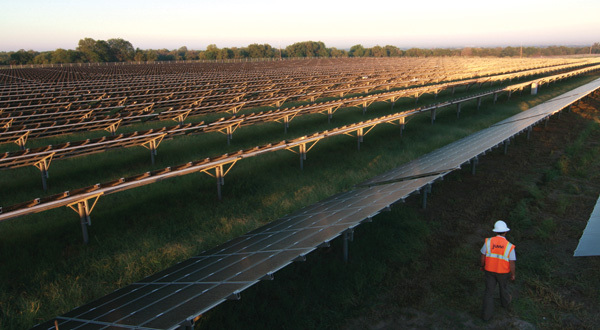 That may be changing, as CPS recently issued a request for proposals for a 50 MW solar farm. The RFP has since been revised to 400 MW, but it must include manufacturing, Cardenas says. As part of the project, a manufacturer of solar-related components must relocate or start a new facility in the San Antonio area. Not only would the manufacturing facility provide jobs, it would also enhance opportunities for local industries and the public to learn about solar manufacturing and installation, he says. "Going forward, we're now saying with our contracts that we want economic development if they are going to site the project in San Antonio," Cardenas says. "With this original RFP, the feedback was that 50 MW may not have been enough to entice a manufacturer to come down here."